Super Hero Boy: Do you hear something? I'm a huge Seuss fan, I can even quote you Green Eggs and Ham almost totally from memory without a book, I've read Cat in the Hat more times to count.. I have a collection of vintage Seuss books... but Horton Hears a Who... sadly I've honestly never read it. Not because I didn't want to but just because I've been so hung up on the other books that it never occurred to me. Needless to say when Horton Hears a Who came out in the theater I was pretty excited as the only better way to experience Seuss than to read him is to watch him! I mean where would Christmas be without the Grinch Stole Christmas? I've watched the Whos in Whoville loose their Christmas presents more times than I can count. So Horton! Here I come. To break down the movie Horton a super observant elephant one day realizes he hears tiny little voices coming from a tiny little flower which turns out to be Who-ville. I wonder if this is the same Who-ville that the Grinch lives on the mountain near.. and if so how exactly is there a mountain on a flower? When does it snow? Am I just reading too much into this? Heh.. I can't help myself. Its not even so much that Who-ville is on the flower its on a speck of dirt on top of the flower (yes yes its even smaller) and how exactly did Horton realize that people were living on that tiny speck of dirt.. Horton must have the best ears known to mankind. Horton then makes it his duty, life's mission, whatever you want to call it to protect the Whos and their tiny tiny little world no matter what as as Horton says "A person is a person no matter how small". I have to say my favorite Who has to be little Jo Jo who looks a bit like a emo black wearing teenager Who. Who could resist a Who like that? Ok maybe its time I stop saying Who. Needless to say Horton Hears a Who is a keeper. I plan on going out and getting Connor the Horton Hears a Who Gift Set for Christmas as our screener didn't allow us to finish watching the movie and I'm dying to know how it sends. Plus who can resist that little Horton plush that comes with the set? 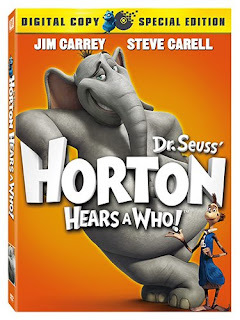 You can pick up your own copy of Horton Hears a Who on Amazon!